The report analyses the approaches to localization for 51 US retail websites in Australia, Japan, Mexico and for 42 UK retailers for Australia, France, Germany and the USA to see how the approaches differ between the different countries, cultures and languages. 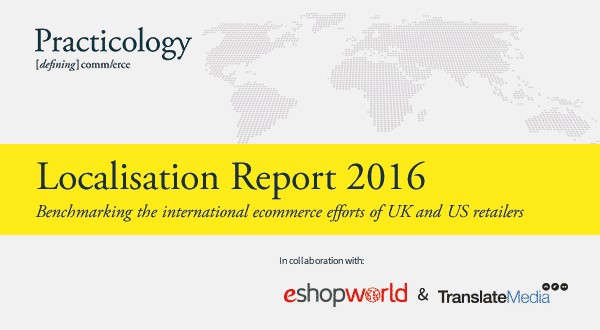 The report assesses UK and US retailers’ localization efforts in a number of areas including: use of language across the site, merchandising and offers, mobile optimisation, search engine optimisation, social media, customer services, delivery and returns, pricing and payment. It also appears that UK retailers appear to take a lot more care to completely localize their meta data for the US market (76%) than the Americans do for the UK (48%). Just 16% of UK retailers reviewed have created a German or French app, but 88% offer a German mobile or responsive site and 92% offer mobile or responsive sites in French. Retailers still have a long way to go in providing local customer service, even in English-speaking regions. E.g. only 32% of UK retailers definitely provide customer service to Australian online customers within Australian business hours. Visit this page to download your FREE copy of this report and start applying best practice website localization techniques and processes for your organization’s translation projects.